Tipsy Robot with its’ dual robotic bartending team allows you to create an almost limitless number of alcoholic and nonalcoholic drink combinations by accessing a simple app. The cocktail creations will then be assembled by two robotic arms, whose movements – shown on a large display positioned behind the bar – mimic the actions of a bartender, from the shaking of a martini to the thin slicing of a lemon garnish to the muddling of a mojito. The real actors of the bar are robots from iconic KUKA Robotic Corporation of Germany, one of the world’s leading suppliers of robot technology and system engineering, founded in 1889. The Tipsy Robot systems are customizable and can have two, three or even more robotic arms operating independently of one another. At the heart of the installation is the automated bar integrated into a futuristic designed platform which contains all of the required traditional bar systems and utilities. The core structure integrates the versatility of robots with different typologies, along with liquid dispensing systems, garnishes, ice dispensers and all other functions needed to prepare world class cocktails. The app is the core of the Tipsy Robot experience. 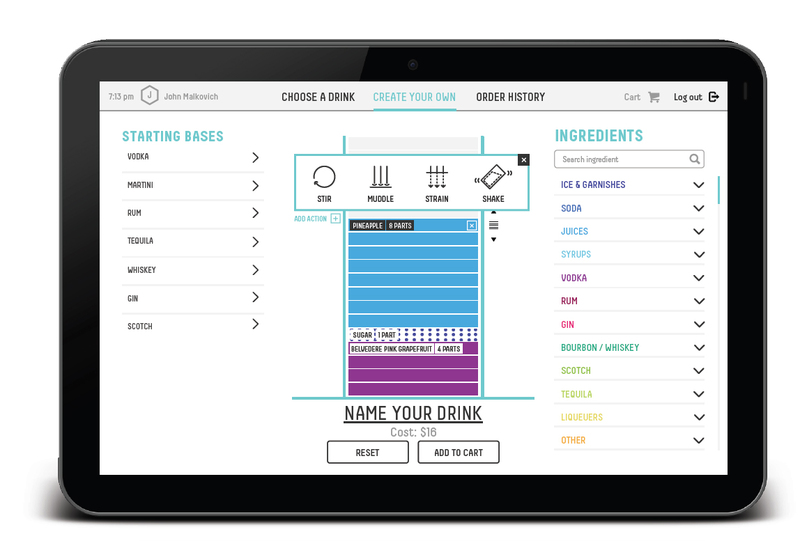 It allows you to log in, create a user profile, explore the existing drink recipes or create new ones and process the order. Ultimately, you can share your experience both within the application and on external social platforms. Visit our Instagram page on this website to see virtually real-time social media posts. There is no limit to the amount of recipes that the app can propose. You can select a pre-existing cocktail, add and remove one or more ingredients while adjusting the quantities according to their desires. 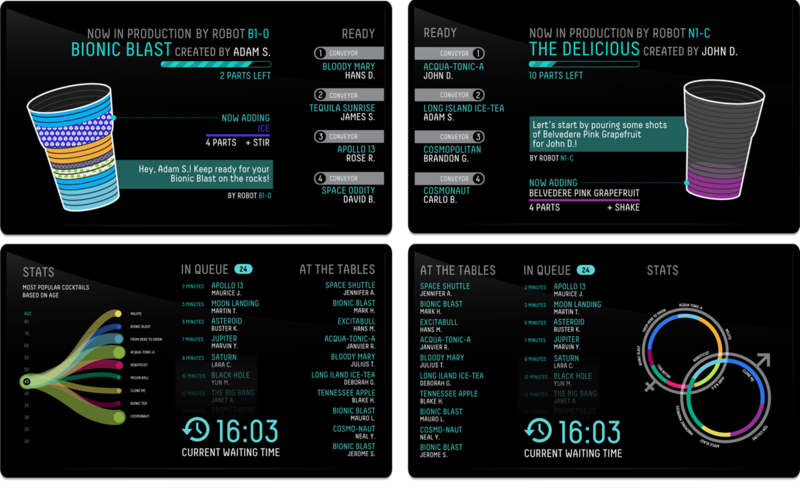 You can also add garnishes and modify the actions to be performed by the robot. Finally, you can name your own drink and save it for a later order. In the Tipsy Robot experience, social connections are woven through the creation and mixing of ingredients, which are then fed back to you through large video wall displays. On the displays you can find functional and real-time information such as your position in the drink queue, a description of the drinks in process, the ingredients used as drinks are being made, along with the wait time for your drink order. Additionally, a set of dynamic infographics shows how others enjoyed their creations along with drink ratings and other data gathered in real-time by the automated systems.